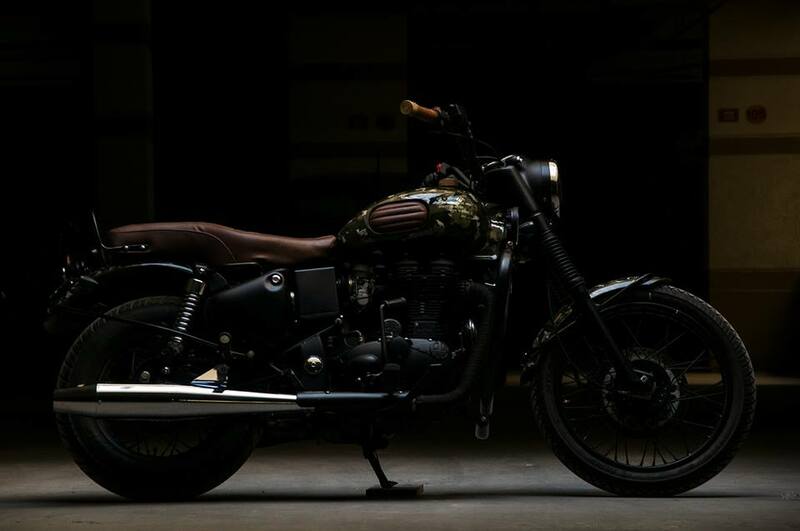 This is 2011 Royal Enfield Electra came to EIMOR Customs from Assam. The owner of this bike serves in the Indian Army. It was a matter of pride and a privilege to be able to serve anyone from the Indian Defence Forces. Eimor Customs' client wanted to give his bike a minimal yet aesthetically sound makeover. And like any defence personal he is very much emotionally attached and proud about his battalion, which is "Bombay Engineer Group" or "The Bombay Sappers" a battalion which has huge historical importance since 1780. The list of battle honours is long; this battalion has also received all the three highest gallantry awards ~ Pre-Independence [Victoria Cross] & Post-Independence [Param Vir Chakra (highest military decoration awarded for valour during wartime) & Ashok Chakra (highest peacetime military decoration awarded for valour)]. Eimor Customs focussed on making the bike peppier and sporty. The wheels are sleeker with a 19" and 15" combination. That existing tank was customised with thigh pads matching the seat upholstery, and the tank cap shifted to one side, is made of brass and bears the signature of the client himself. The handlebar end weights are also made of brass and bear the company branding. The headlight, the taillight and indicators have been changed to LED. The paint job is simple yet interesting. The tank and the two mudguards are having olive green camouflage with a rugged and worn out texture. The logos and insignias and shlokas from Bhagwat Gita (Chapter 2 Verse 37) is done with golden and fluorescent green luminescent paint. The rest of the bike is painted in matte black. The seat is made in brown to complement the look. The handle grips are decorated with leather strips. Eimor Customs have named the bike Parantapa. It is one of the twelve names of Arjuna, which means one who destroys the enemy with his power of concentration. And this is their tribute to one of the oldest battalions of the Indian Army.